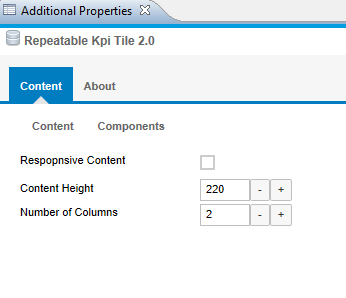 finally, following the “what next” topic in KPI Tile, here the new “Repeatable KPI Tile” which is now Data Bound. The original Post can be found here, Design Studio SDK: (Generic) Kpi Tile. Please check the initial post for general information, I do not want to repeat all here. Second important post is here, Design Studio SDK: (Generic) Kpi Tile Functions for Complex Properties. In general, the number of KPIs equals to number of rows in the data source. The real KPI size is calculated from the current size and number of rows. This component is now supporting data source assignment, so you have to assign some data source (see example below and in the application). 2. Make “binding” to dimension. 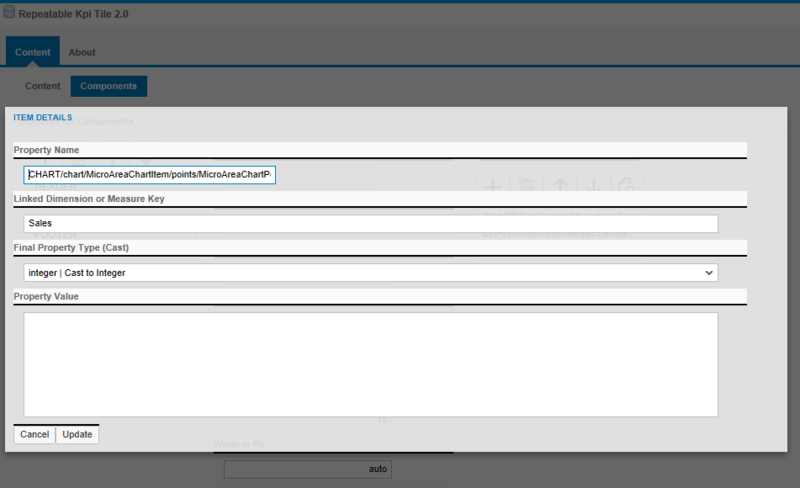 The next step is to create a property and use the new setting “Linked Dimension or Measure Key”. This one is required to get the connection to data from corresponding data source. for some properties it is required to cast the data source to specific type, eg. for the micro charts it must be an integer, even if the data source is bringing double value as measure. Choose the correct cast – in other cases there will be no display. no big change to the standard KPI Tile in this part, but the “Content” has now the complex properties. also, the cast property is visible, required to cast correctly especially for micro charts as those are expecting integers. Just amazing Karol! At some point we should merge our tile container approach with the available tile components that we already have on the community repos. That way we will get responsive design out of the box. I need to tidy up the code, and plan to share the source with the SCN community. Thank you for sharing your code! I like it a lot and thanks for the nice video you posted there. 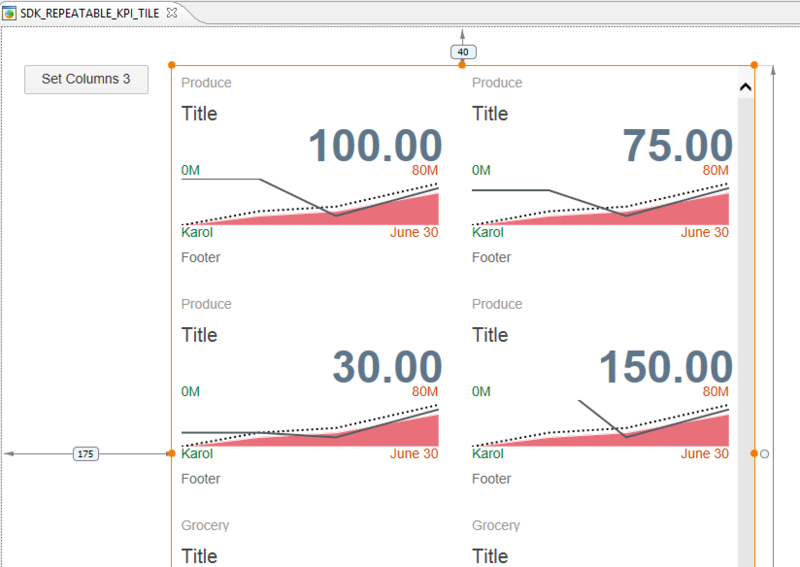 Did you also consider Karol’s repeatable Tile approach for truly dynamic KPI dashboards? I’m not sure what aspect of Karol’s approach you are referring to. I have tried to make it as dynamic as possible, and incorporate as much of Karol’s work as I could. But probably I don’t “get” everything what he did. The tile contents that has N-to-1 relationship to a tile, may come as an XML, similarly to Karol’s approach. Examples: charts and specifically chart points. There are many chart points to a single tile. Can you help me how can we merge my update to the community code base? it seems there is a merge conflict you need to resolve first at legacy_src/org.scn.community.databound/contribution.ztl. Mike Howles are you able to allow the pull request afterwards? I see only a button to merge the external pull request. Thanks for pointing out the conflict. I have resolved now and closed the pull request. Since than I have done some new enhancements. If it goes well, I would initiate thoese in a new pull request.